The AMC show The Killing is back. The show had been canceled after airing its second season in 2012. The cancellation was not all that surprising. The show had steadily lost viewers after season one. Now that it’s back, I hope some of the flaws that hampered the first two seasons have been dealt with. Because, though it had some weaker points, I thought The Killing was a great show. The two lead characters – Linden (Mireille Enos) and Holder (Joel Kinnamen) – alone make the show worth watching. They are both so compelling, even though they are not particularly likeable in the traditional sense. Nonetheless, it’s easy to relate to them. They are both dissatisfied with their lives in some way, and they feel like they are constantly facing obstacles in doing what they love most. Though most of us aren’t dealing with grisly murder cases, I think it’s easy to identify with that feeling of frustration when things just aren’t going the way you want them to. What makes them great characters is that they seem like real people. They do a lot of things right, but they also make the wrong decisions sometimes. Things don’t fall into place, and that helps keep the story moving along – and adds a few unexpected twists and turns. This time around, Linden and Holder are on a completely new case. Rosie Larsen (the murdered who the first two seasons were based on) is long behind them. I guess I should say that only Holder has a new case. Linden has left the force and is now working as a ferry security guard in a small town (Vashon Island, WA). Though everyone has moved on, there are some ties to the first two seasons. The biggest tie is that picture of the trees drawn by a little boy whose mother had been murdered by the boy’s father. It was a case Linden had previously been obsessed with, in the same way she became obsessed with the Rosie Larsen case. I thought using that picture was a great way to tie the seasons together while moving on to a new story. I also think it’s a cool way to get more of Linden’s troubled back story. 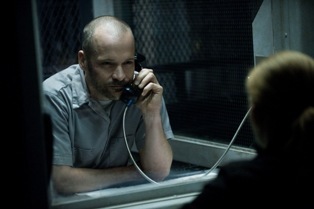 The boy’s father, Tom Seward (Peter Sarsgaard), is awaiting his execution on death row. Since the show takes place in Washington, Seward has chosen hanging as his method of execution. I’m not how much of a factor that is going to play in the story, but it’s pretty creepy how infatuated Seward seems to be with his own death. He’s also a very bad dude that no one should want to mess with. 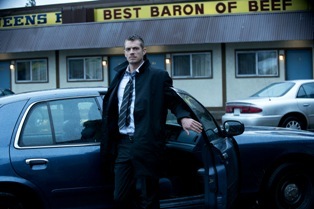 Holder, however, sees the connection to Linden and lures her back into his world. The death row setting is a pretty cool set up for the new season. However, this show is about murder, and we’ve got that too. Once again we are dealing with teenagers, but this time they are not quite as wholesome as Rosie Larsen seemed. They also don’t have loving families who are worried about them. In this case they are homeless teens, who are prostituting themselves to make ends meet. When one of them is brutally murdered, Holder wants to figure out what’s going on, though no one (even the other cops) really seems to care. I found the first episode of the new season to be pretty intriguing. There were a lot of new characters and so many new ideas presented that I did find it hard to keep track of how everything was connected, but I do want to see where they are going with the story. This season seems pretty dark in tone. There was almost no relief from dreariness of the setting. We went from death row, to dirty city streets, to the world’s worst mother. Even Linden’s new life in the countryside was unpleasant. Maybe that is part of the appeal – it’s a vicarious look at a side of life we hope to never really be a part of. 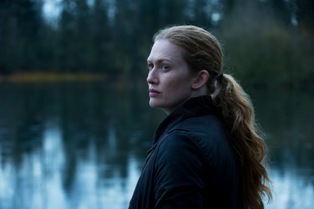 For more information on AMC’s The Killing, visit the official website.